I received my August Birchbox a couple days ago and am once again happy with my box. I feel like I got more than my $10 back in sample products. 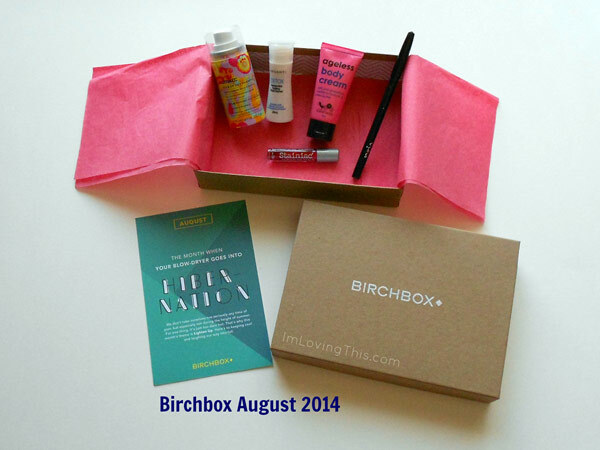 This month the theme for the Birchbox is, Lighten Up. It says that summer is too hot and here’s to keeping cool and laughing our way to fall. Don’t really understand how my products fit with the theme, but doesn’t matter to me anyways. This month I received five products in my Birchbox, see my thoughts on the products below. I like receiving these mini dry shampoos because they are great for traveling. This one comes in what is probably the cutest spray bottle I’ve ever seen. It smells really good, like a good perfume. I find that most dry shampoos smell bad, this one does not! I have blonde hair so I can’t really tell if it leaves a white-cast, I sprayed some onto my hand and it left a big white dot, so not sure how it would work for darker hair. I used this dry shampoo yesterday and it seems to work well. It says that it is free of Talc if that is something you are looking for in a dry shampoo. It retails for $21, so personally I would never buy it. But if you are in the market for a higher end dry shampoo then you might consider trying this one. This body cream is infused a grapefruit-sandalwood fragrance and says it will leave your skin silky smooth. I will probably save this for traveling as well or for my purse or car. I like the lotion, it has a nice, refreshing, light fragrance. It really leaves my skin feeling smooth, it’s pretty amazing actually! It did take a minute or two for the lotion to seep into my skin, but was worth it. I probably wouldn’t purchase this lotion for myself as it is $22 for a full size. But I am going to write it down as a gift idea for others because I really enjoy it. I’m not 100% sure, but I believe this is a full-sized eyeliner which retails for $15. I couldn’t find the weight of the full-sized liner online to compare. I’ve received a few eyeliners in my Birchbox since I signed up and I don’t ever reach for them because I’m set on the ones I already use. This liner says that it is enriched with Vitamin E and it is waterproof as well. This black liner glides on very smooth but it isn’t the darkest liner that I own. I probably won’t ever use this, it just isn’t that black. It smudges completely off my hand very easily so I’m not sure how well it would even hold up. This is probably the only product in my Birchbox this month that I wouldn’t recommend. I was really excited to receive this lip and cheek stain in the shade, ‘Beauty Queen’. I’ve always wanted to try Benetint, but have yet to so this is a great alternative. I tried the stain out on my cheeks yesterday by putting three small dots onto my cheek and smoothing it out. I really liked the effect it gave me, a flushed glow on my cheeks. I haven’t tried it out on my lips yet but probably will soon and will let you know what I think. I didn’t get much in the sample so I don’t want to waste any. 🙂 The full size retails for $17 which is much cheaper than the Benetint, so definitely worth checking out if you like cheek and lip stains. Overall I was happy with my Birchbox this month and will be staying subscribed. I received my first Ipsy Glam Bag this month and am not sure which subscription service I enjoy more yet. If you are interested you can see previous subscription box openings here. I have been debating on signing up to Birchbox. I think I’m going to sign up now cause it looks like you get lots of fun stuff.